When I started making cardinals in stained glass in late 2011, my friend, Tracey, asked about stained glass ornaments of red birds. I did not have any at the time and was not able to work on any new patterns before Christmas. Wasting little time, I wanted to get started early on them for this year. 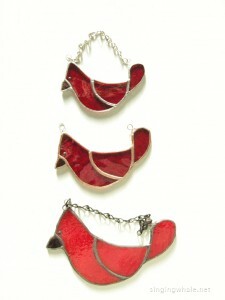 I based these also on the same cardinal photo I used to create the pattern for the cardinals in stained glass. My intention was to make a fairly simple pattern, just a few pieces of glass, so they could made fairly quickly and easily. I am very curious if people like them. In the end, I wound up with three sizes, which you can see illustrated in the gallery. The largest seems too large to function as an ornament but would make a lovely suncatcher in a smaller window. I used a different glass on this one than the other two, a brighter red that’s more translucent than transparent. The other two samples were done in red waterglass, which looks lovely in a window with light coming behind, but probably would be too dark to hang on a tree. So, ornaments would likely get made in the brighter red going forward. I also did each in a different patina for variety, with black on the largest, copper for the middle sized, and silver on the smallest. I need to get matching chain and ribbon for copper patina, a finish I actually hadn’t done on anything for a while. Time to stock up! I’d also used a darker brown glass for the beaks on these, and would use the solid black glass going forward. Thanks for looking, check out more photos in the gallery, enjoy, and please do let me know what you think! This entry was posted in new works. Bookmark the permalink. Hello! Apologies for the slow reply. I typically sell these at $10 each and I do have some made now. How many are you seeking? Feel free to drop me an email at amy@singingwhale.net and I will get right back to you. We can probably work out something that will amenable to all. Thank you!